I would like to thank everyone for helping me identify my mystery fruit yesterday. Most of you were correct. It was passion fruit. And it turned out to be the fruit I really enjoyed in the Dominican. I remembered the smell of it, but not the name. Now I need to track down some other fruit to see if I can stump all of you. It might turn into a fun project and a way to learn about more fruit from all over the world. I will be restricted to what I can buy in London or photos I can take while traveling. I’ve seen too many episodes of Nothing to Declare so I won’t attempt smuggling any food into the country. By the way, if you haven’t seen the show and are traveling to Australia anytime soon, do not bring any food. If you do, declare it. Big fines or worse. Even the food they gave you on the plane. You have to declare that. Don’t get held up in customs–it isn’t worth it. This entry was posted in Random and tagged Australia, Customs, Dominican Republic, Food, Fruit, Mystery Fruit, Nothing to Declare, Passion Fruit, Photo, Photography. Bookmark the permalink. 28 Responses to Passion Fruit! From what I’ve seen on the show, they don’t mess around. Trust me, I won’t be bringing any food when I visit. Of course and delicious too no doubt! I enjoyed it and imagined I was eating it on a tropical island. I’ll do my best to stump you! I’m really bad at identifying most things, such as animals, birds, trees, and now fruit! Hey, another mystery game. This will be fun :). I’ll be keeping on eye on you missy! And no whining about it! Really–this one was a gift. I hope you enjoy your weekend. Customs officers scare me. Don’t know why, they just do. Yeah, I’m always relieved when I get through without being hassled. I know it’s their job, but do they have to be so terrifying. One of my favorite fruits. 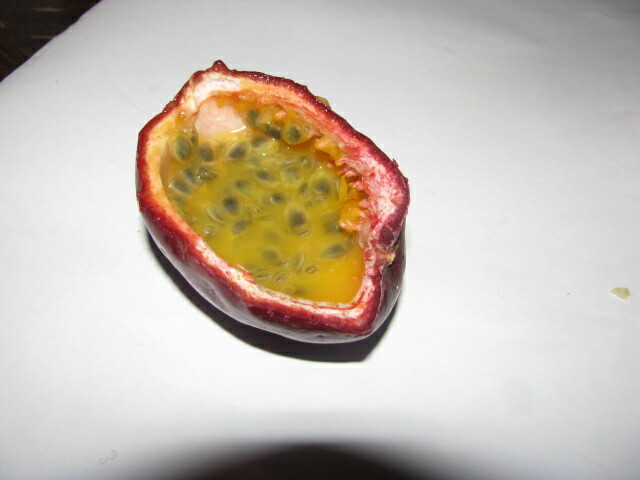 I have passion fruit on my backyard. The flowers are very beautiful too. It’s a shame they only last for a day. Glad you identified your mystery fruit! I’ll have to keep an eye out for that one. thanks!